Feedback Ferret D, Filter from Peavey. The Feeback Ferret D has been in my rig since 2009, it is a feedback processor that has panic filters on it. Using the Ferret D will get rid of all of the horrible frequencies that need to be gutted out. You can simply use a filter that the Ferret D offers and it will find certain frequencies that you tell it to and it will eliminate them. There are over 16 different filters to choose from and the Ferret even has four different presets to fit with whatever you environment is. Using the Ferret D is simple because it is just about using the filters efficiently. Sometimes as we all know you might experience some sudden feedback that can really ruin your set and fast! All you have to do is use one of the Panic Filters and you will quickly have full control over the feedback and you can get rid of it really quickly. If you are into live sound whether you are a DJ for a band or group or an artist setting up your own gear, having the Ferret D is a must have because it will take care of your dirty work and get rid of all of the feedback. 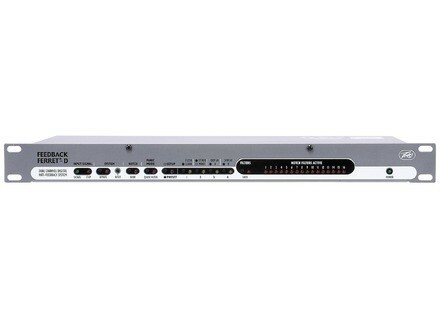 The Ferret D has 2 channels with 2 XLR inputs and 2 XLR/ 2 ¼ TRS outputs. You can rack this unit up and have it in your set up quickly. No matter what setting you are in you will be able to change your options or change filters if you are in a panic situation and have sudden out of nowhere feedback strike your gig. Even you are having some minor feedback sound issues that some people don’t think are that bad, you should still go out and get this unit because it will give you ease of mind knowing that feedback will not take over your performance.